Finally, the talky, political remake of Taken film snobs have been waiting for! Who needs action when a bunch of guys can stand around chatting about decades-old slights? Inescapable is the new film from Canadian director Ruba Nadda. It stars her leading man from Cairo Time, Alexander Siddig, as Adib, a Toronto-based businessman with a secret past as a Syrian intelligence officer who left his home country under dangerous circumstances. His family is unaware of his history, and curiosity has prompted his elder daughter to go to Damascus without telling anyone to see where dear ol' dad grew up. Inescapable begins as Adib receives the news that Muna has gone missing, presumably as retaliation for the sins of her father. Adib blows his own cover, calling on an old flame (Marisa Tomei, The Ides of March) to help him sneak across the border. Once he is on the other side of the world, old acquaintances and foes emerge, as does a complicated narrative about what his daughter was really up to. 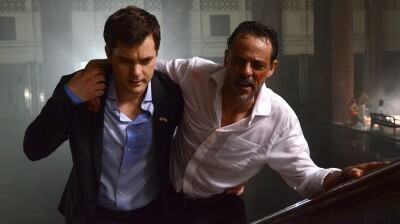 No one wants to help Adib, not even the Canadian embassy worker assigned Muna's case (played by Fringe star Joshua "Pacey" Jackson), but the determined old man refuses to go away and isn't afraid to take a beating or two by way of getting answers. I suppose there is nothing wrong with the basic plot outline of Inescapable. The script is also by Nadda, and she seems to have a facile understanding of Syrian politics and the way black ops work. Then again, maybe not. There is something so lifeless and clinical about how it all fits together, it's hard to tell if the filmmaker is being too true to real espionage (which can often be just a matter of paper shuffling and bean counting) or if she's merely operating with a surface knowledge of how deals go down and is otherwise playing it safe rather than risk flubbing something. The staging is assured enough that I was willing to trust where Inescapable was going, but it's kind of a slog to get there. Which brings me back to the Taken comparison. While the plot of a father rescuing his daughter from bad men is nothing new, one expects a certain passion in tales where a parent's protective instincts are activated. Liam Neeson would take one look at Alexander Siddig and just sneer. Adib may have trained in the Middle East, but he'd be useless against a pack of wolves. That is unless he decided to lull them to sleep by reciting his dialogue like he was reading from an instruction manual for building furniture--which, judging by Siddig's Inescapable performance, is the actor's "method." Joshua Jackson matches him boring intonation for boring intonation, and Marisa Tomei consistently looks like she's stifling a yawn. The lost romance subplot between her character and Adib never really gets going. Presumably Inescapable got made in some vain hope that its Syrian-based story would strike a chord with audiences by touching ever so gently on current events. Perhaps digging deeper into the country's tensions with Israel might have helped, particularly if Nadda was looking to make an intelligent thriller. Some actual gunplay and a genuine attempt at creating a sense of peril really could have helped, too. This middle-of-the-road thing doesn't really do much good for anybody. The widescreen, high-def image on Inescapable (2.40:1 in 1080p) looks excellent, with warm colors and a crisp picture. Grain is noticeably subtle, with no smears, haziness, or hints of DNR. Blacks are strong with no crushing, and overall detail is splendid. The English 5.1 DTS-MA sound option is also really good. There are good effects between speakers, and the mixer knows when to go big with them and when to keep it soft and understated to better suit the atmosphere. A 2.0 lossless PCM track is also provide. Subtitle choices are English for the deaf and hearing impaired and Spanish. A cursory smattering of bonus features includes the expected audio commentary with the director and her cinematographer, Luc Montpellier (The Cry of the Owl), discussing the circumstances of the production and why they chose to make the film the way they did. There is also some on-set footage in the 15 minute "Behind the Scenes" featurette and some added voices in a half-hour Q&A with Nadda, Siddig, and one of the supporting actors. There is also a very short deleted scenes section and Inescapable's theatrical trailer. All of the supplements are in HD. Rent It. It's not a terrible movie, so no need to junk bin it completely, but approach Inescapable with reserved expectations. It's a one-time view, maybe good to pass the time when sorting receipts for taxes or picking up around the house. Even Joshua Jackson devotees and Marisa Tomei fans (of which I am one) will be hard-pressed to hang on to their copy of this thin thriller. Writer/director Ruba Nadda had good intentions and a decent, timely idea, but little of note materializes on the screen.